The arts and architecture of northern Laos are enough reason to travel there. Toss in a relaxing boat trip on the Mekong River, a ride on a rescued retired elephant, a day of dyeing and weaving your own textiles, and a Buddhist ceremonial blessing and you have a KarmaQuest eco-cultural trip of a lifetime. We take you deep into the culture and lives of the Lao people in one of the loveliest, most well-preserved small cities of Southeast Asia: Luang Prabang. Our expandable core eight-day itinerary allows you time to step into a monastery prayer session, stroll through the night market or browse among Luang Prabang’s many small cafes and tiny arts and craft shops at your leisure. Feeling creative? Pick any color of the rainbow and learn to make natural dyes from wild jungle products then dye a silk scarf in a boiling vat. Watch silk worms spin threads and then weave a silk runner on a traditional Lao loom. Or learn how to cook Lao classic recipes, known for their mix of sweet, sour and bitter flavors. We’ll also introduce you to our favorite spots and experiences: a small museum of ethnic peoples and arts, an elephant conservation camp, offering alms to saffron-robed Buddhist monks in the early morning hours, and to a blessing ceremony and music and dance performance held in a 115 year old wooden stilted home in a lotus pond. Our eight day “core trip” to Laos begins in Bangkok, Thailand and travels to Chiang Rai, northern Thailand, where you’ll board a motorized long boat for a two day glide on the Mekong River. Sitting comfortably in shaded cushioned chairs, you’ll stop at several ethnic villages where age old weaving techniques carry on, helping to support better schools for the village children. After one night in a picturesque lodge en route, you’ll land at Luang Prabang, jewel of Indochina, your home and base for exploring the city and surroundings for the next four days. Designated as a UNESCO World Heritage Site in 1995, Luang Prabang is an outstanding example of the fusion of traditional Laotian architecture and European colonial styles of the 19th and 20th centuries. Besides the afore-mentioned sights and learning opportunities, you will visit ecotourism and cultural conservation sites that benefit local people and the arts. Our patronage helps generate income that is linked to sustainable practices, helping to keep Luang Prabang’s cultural and environmental heritage alive and strong. Day 1: Bangkok: Transfer you to your hotel. Overnight in Bangkok. Day 2: Chiang Rai: Catch an afternoon flight to northern Thailand. Enjoy a spa or stroll to the lively night market. Overnight in Chiang Rai. Day 3: Mekong Boat Ride: Board a comfortable river barge for a cruise down the Mekong River. Visit a hill tribe en route. Check into your lodge and take dinner on a terrace overlooking the Mekong River. Overnight in Pak Beng. Day 4: Cruise into Luang Prabang: Continue the river journey. Make a short stop at a H’mong village, Pak-Ou village and visit Tam Ting "Cave of a Thousand Buddhas". 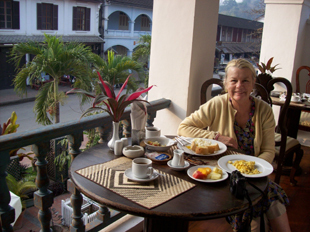 Arrive at Luang Prabang and check into your hotel. Day 5: Luang Prabang: Rise early to join local residents giving alms – cooked rice, fruit, nuts, curries – to Buddhist monks. Later, visit a traditional Lao village known its exquisite weavings, and learn about Laos and its history at the national museum, the arts and ethnology centre and the children’s cultural center.Take in the serenity and artistry at various wats (Buddhist temples). End the day on the summit of Phousi Hill for a panoramic view of the city. Day 6: Luang Prabang: Venture into the country side to Elephant Camp. Here an ecotourism and conservation program cares for elephants while giving local people employment as mahouts. Return to Luang Prabang and enjoy free time to stroll and shop. In the evening, attend a special Barci ceremony, one of the most charming ceremonies in Laos. 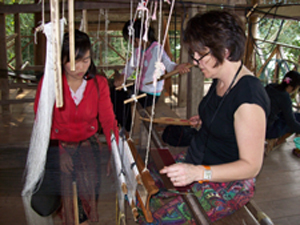 Day 7: Luang Prabang: Today a special treat is in store: you can spend an afternoon or the entire day at a peaceful outdoor workshop by the river, learning to dye and/or weave textiles in the fashion of a Lao. Learn to prepare dyes from natural products and dye your own silk scarf. Or learn to operate an upright loom and weave a placemat or runner. You’ll gain new appreciation for the skills required of local artisans. Day 8: Depart Luang Prabang: From Luang Prabang, you have a choice of returning to Bangkok and heading home, or selecting an onward destinations – an “Add-on” – from the list below. All are accessible within a short flight and each offers a uniquely savory flavor of yet another South East Asian culture. Countless temples and pagodas with Thai and Khmer shrines and relics are a mirror of the countries checkered past. There are good restaurants and excellent shopping opportunities for Lao handicrafts at the Morning Market and at Les Artisans Laos. The temples of Angkor: one of the great wonders of the world, await. Built during the 7th to 10th centuries to honor Buddhist and Hindu deities, this magnificent temple complex (a UNESCO World Heritage Site) displays superb bas relief; giant carved faces straddling ancient stone towers, and vast complexes built to endure the ravages of time, warfare and the jungle. Hanoi, a classic Asian city where life happens on the street: visit the romantic French Quarter’s tree-lined streets of cafes and art studios; chuckle over playful water puppet dramas; and recall Vietnam’s rich cultural history and political turmoil even before the “American war” at well-displayed museums. A longer trip allows a visit to Halong Bay (another UNESCO World Heritage Site) where you’ll overnight on a restored “junk” (boat), island hopping and relaxing amidst this unique water-world. Bangkok is much more than the gateway to South East Asia. Spend an extra night or two here and take in the jewel-studded Royal Palace, a quiet boat ride along the canals, a health spa and spicy Thai food. Or venture out to Ayuthaya, ancient capital city of Siam. Add two nights in Chiang Mai or Chiang Rai, visiting the Queen’s botanic gardens, an elephant conservation center, orchid gardens, yoga and massage centers and much more. Or combine the perfect beach or jungle getaway with an opportunity to give back: help plant endangered mangroves; indulge in spa treatments at an eco-lodge that aids tsunami victims; or become a “voluntourist” in one of many ways. Our classic seven day tour takes in Yangon, Bagan and Inle Lake along the classic Burma triangle tour route. Circle gold-glossed Shwedagon stupa with Buddhist devotees; peer at ancient frescoes and giant Buddhas inside Bagan’s 2,500 temples; and boat among villages on stilts at Inle Lake. If you have just 3-5 days, pick 2 of the above and vow to come back. As this trip is highly customized, we prefer to provide the trip cost based upon the itinerary selected.